Superman Earth One is a contemporary re-imagining of the last son of Krypton’s journey to become the man of steel. Clark Kent arrives in Metropolis with the purpose of finding his way into the world while finding a job so he can support his widowed mother. These days, most people have a tough time getting a job. Clark’s problem is the opposite. He can land any job he wants and be the best in the world at it while making a lot of money. The catch is he wants to do something real, something that will make a difference, without the aid of his powers. It’s an uncommon problem for an uncommon person which adds a level of depth to the character of our iconic hero that is nonexistent in the current cannon. Clark isn’t looking to fulfill a destiny, he just wants to fit in. The sins of the past come to haunt Clark as an alien invasion led by their leader, Tyrell, arrives to cause chaos and destruction to complete their decades long mission. The chain of events that follow pull Clark towards the destiny he shunned: to become Earth’s hero. Martha Kent’s character arc was simple and well written. She exudes a mother’s love, wanting her son to be happy and knows he is worthy of more than scoring touchdowns and making someone else rich. It’s clear she would happily forsake any monetary gain from Clark’s career choice if he would embrace his true calling. Lois Lane is a determined reporter who is big on finding and reporting the truth in her articles. While her and Superman cross paths, there is no romantic element to their story. The most powerful sets of dialogue come when Martha tells Clark why he should not wear a mask and when Lois is talking to Jimmy about the moment in life when things change. Shane Davis’s art work depicts young Clark of average height and muscular build that resembles a professional fighter instead of a He-Man physique. He wears a hooded coat and jeans with no glasses. His hair is reminiscent of Edward from Twilight. Instead of bumbling around and trying to make people forget about him, he slouches when he walks and is just trying to blend in. 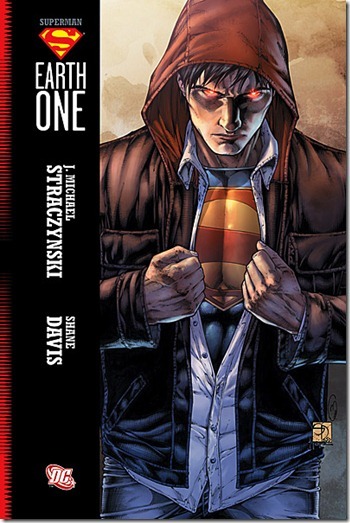 I highly recommended Straczynski’s story to anyone looking for something different. This might not be your cup of tea if you love continuity. Superman is a hero who’s principles of right and wrong are influenced by an era where things were black and white, but we live in a more complicated time. This perfect character who solves the world’s problems with ease is out of touch with today’s world. Then again, we read comic books because they help us escape from the real world. It’s easy to see why people live vicariously through this infallible hero who remains unfaltered no matter what evil stands in his way. No matter which version of Superman you prefer, he remains the hero we all dream of.